There’s something you can’t miss as you make your way through Managua. They hover tall, like an amusement park spectacle on the streets and roundabouts. At night their yellow glow can be seen through the traffic miles away. They are called the Trees of life. As one commentator put it, it’s as if we’ve walked into the chocolate factory and are now in Willy Wonka’s world. Trees of life on Bolivar Avenue in Managua, Nicaragua. 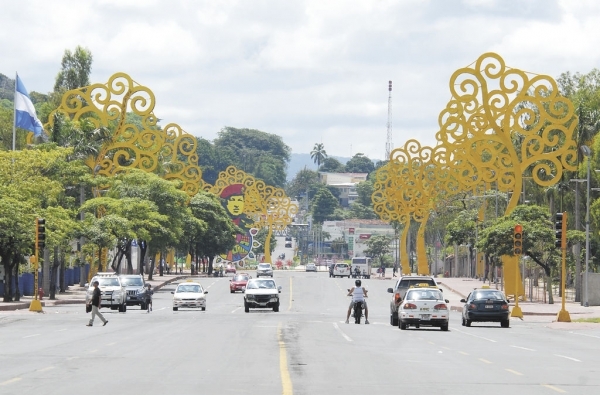 It is said that these trees of life are an initiative of the country’s first lady, Rosario Murillo, who sees them as representative of Nicaragua’s happiness and prosperity. In one of Murillo’s speeches she announced that the trees are a way to celebrate the “…really happy feeling inside, as we convert the city into a celebration of its great blessing, prosperity and victory”. It’s obvious that the government is using this spectacle of lights as a political strategy. The trees are big, flashy and opulent. So look, citizens of ours, Nicaragua is booming! See how happy we have made you! They have underestimated their citizens though, who see right into the heart of the irony of it all. These trees of life have become a running joke around the country. Most meetings and workshops I attend include at least one sardonic reference to them. The government’s attempt at using light installations to construct a reality that does not exist has failed. Critics have pointed out it would have been more appropriate to have planted real, living trees if you´re going to call them the trees of life after all. To me they only serve as a reminder of how industrial and sterile the world has become. We forgo nature in favour of the artificial. We create that which is supposed to celebrate the very thing we have destroyed – the earth’s natural resources. And what about the cost? There has been an unsurprising lack of transparency from the government, but the newspaper Confidencial has calculated that each tree likely costs more than $20 000 US. This doesn’t include the costs associated with energy consumption and security – they are guarded by watchmen 24 hours a day. Nicaragua is the poorest country in Central America. Nearly half of it’s population lives in rural areas and 68% of them are surviving on just over $1 US a day. By my count there are about 25 of these trees in Managua. It’s shameful that $500 000 then was spent on something so frivolous. Why not invest that money in education or in social services such as women’s shelters or healthcare? In Esquipulas there is just one small health centre – closed at night. If you have an emergency outside of opening hours, you either wait or you drive the 2 hours to the nearest big city (if you have a car). Half of a million dollars could go a long way in this country, and would have been better spent investing in the welfare of the people than creating an eye sore in the capital. This entry was tagged arboles de la vida, ironic, irony, Managua, Nicaragua, trees of life. Bookmark the permalink.